While the United States celebrated Thanksgiving, Mexican President Enrique Peña Nieto spent the day in a border town so small no Mexican president had ever gone there. Peña Nieto has already made history by distancing himself from previous Mexican presidents. 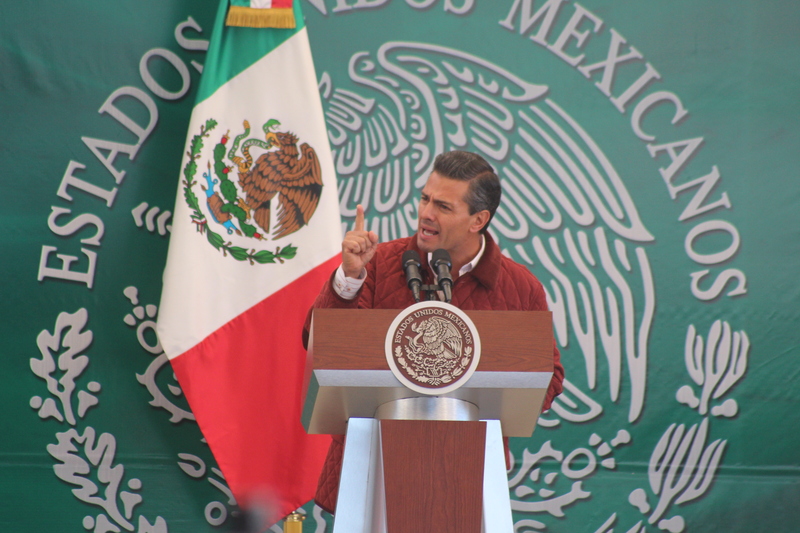 Enrique Peña Nieto visited Ojinaga, Chihuahua and sent two messages simultaneously, one for domestic consumption, the other to Washington. He wants foreign investment in the state-owned oil industry, an unthinkable act in the eyes of Mexican nationalists. He arrested the corrupt but politically powerful head of the teachers’ union, he is attacking monopolies in telecommunications and now he becomes first president to come to Ojinaga, Chihuahua, a dusty brown-hued slice of the border that sits across from Presidio, Texas. Together in relative isolation, yet strategically located for trade, each town considers itself an extension of the other. Peña Nieto announced an economic stimulus program that includes controversial higher taxes for border businesses. Revenue from those taxes would be deployed to bolster social assistance programs, including a plan to ease hunger in border states. Peña Nieto simultaneously sent messages aimed at two audiences. He signaled to Washington that he is serious about expanding border trade in a region that has been hampered in a post 9-11 world. And for his domestic audience Peña Nieto focused on the economy in contrast to his predecessor’s drug war narrative. He said he wants a more competitive Mexico that will attract investment and more jobs. Peña Nieto suggested the border economy has been neglected by previous Mexican administrations. He said series of internal checkpoints that drag down border commerce are about to be closed. He believes the move will foster easier transport of products inside Mexico and allow Mexicans crossing in both directions to save time. And he said checkpoints will be removed in several other Mexican states. He explained why. 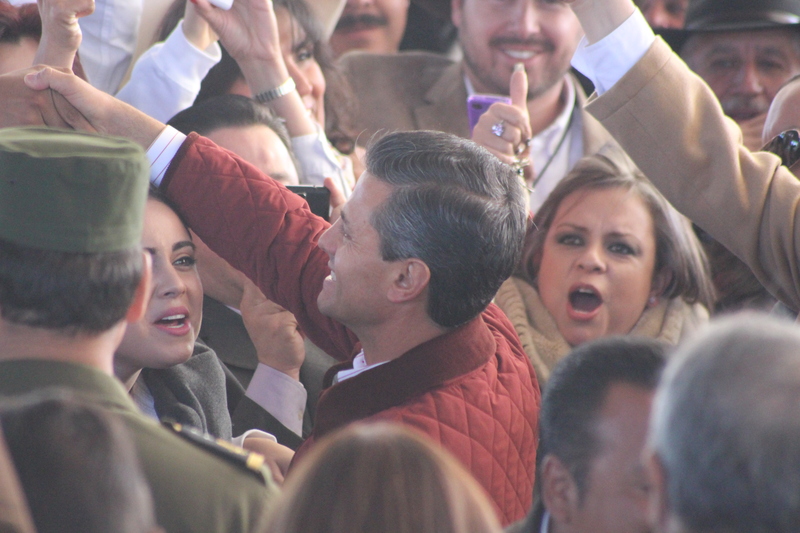 “For the benefit of the border zone, not just to help Chihuahua but all of the country,” Peña Nieto said in Spanish. Some Americans here say a heavy-handed, one-size-fits-all border policy designed far away in Washington, DC has crippled a once thriving interdependent border economy. Chihuahua rancher rancher Alberto Attolini said borderland Mexicans know a similar feeling when it comes to their government. “We are so far from Mexico City,” Attolini said. The U.S. delegation that crossed from Presidio, Texas to welcome the Mexican head of state was led by Carlos Nieto. He is the son of a prominent family that’s politically active in both cities. “This is a very old, forgotten border community,” Nieto told a reporter. Presidio Economic Development Director Brad Newton said he depends on commerce from Ojinaga. Pena Nieto’s visit to a place many Mexicans have never heard of may be a premonition. There are bilateral plans under discussion to build a rail terminal linking Sinaloa with Texas and expand the international bridge linking Ojinaga and Presidio, two plans that now seem at least slightly closer following an unprecedented presidential visit. Peña Nieto is the new face of the PRI, the party that ruled Mexico for 71 years until 2000. Mexico’s president left his security detail to pose with students before departing for Mexico City. One of his talking points was his wish to expand job opportunities for Mexico’s youth. 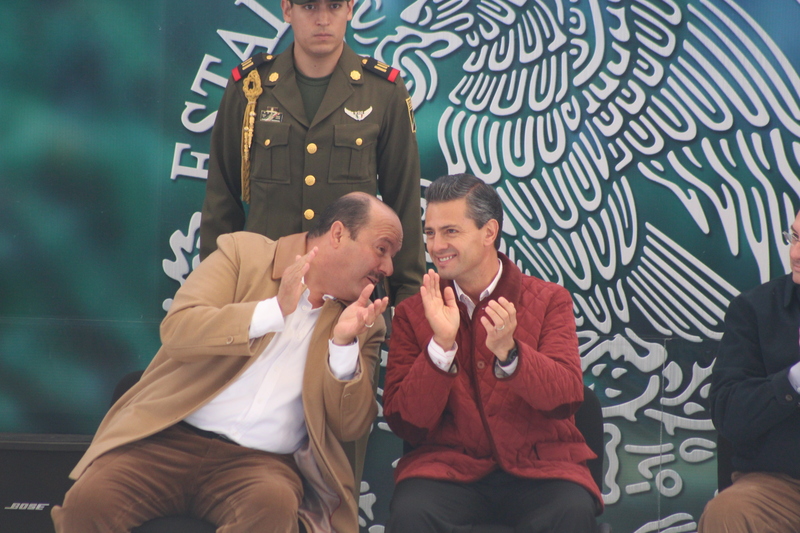 Peña Nieto shared the stage with Chihuahua Gov. César Duarte. Duarte defended Peña’s tax reform initiatives that include controversial taxes on border businesses. This entry was posted in Photography, Radio. Bookmark the permalink.